It’s a quirky display of varying art forms, from pottery and clay sculptures to basket weaving and videos of knitting. The vision, pieced together by curator Heather Anderson, is one of merging art and craft, abstract and practical. 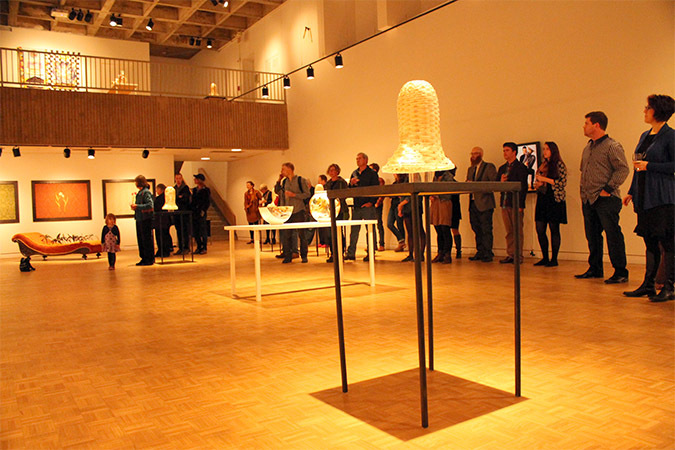 Making Otherwise: Craft and Material Fluency in Contemporary Art is the exhibit featured at Mount Saint Vincent Art Gallery until Nov. 30. “Artists who are using craft materials and approaches and concepts in their work,” Anderson says, are ones that she wanted to showcase. Mark Courtemanche, one of the featured artists, used clay to sculpt an array of beautiful, hand painted and fully functional tools. His upbringing inspired him to build these pieces. The hammers, wrenches and more resemble those you would see in an old tool shed, and the clay wood shavings in the dustpan make you feel like you are standing in your grandfather’s workshop. Courtemanche’s desire to make the functional artistic inspired Anderson to look at the hand-made in a different light. The exhibit is spread across two levels of the gallery, featuring moody lighting. Music from one of the video pieces quietly fills the room. Each artist featured brought different styles and emotions to the space. All parts tie together neatly. Basket head masks are found on the main floor, but one is seen alone on the second floor. Four intricately painted vases are placed on a table upstairs, and their partners, a large bowl and pot, are downstairs. Susan Wolf is the gallery’s program director and her passion for the art displayed, as well as others’ appreciation for art, motivates her to bring in different art forms, and to keep encouraging newcomers to the gallery. The gallery is a resource for students at the Mount and other universities around the city. And Wolf loves the idea of introducing art and exhibits to those who aren’t familiar with the scene. 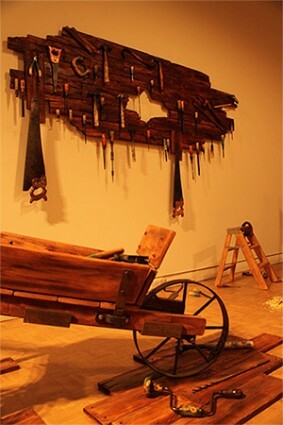 Ursula Johnson is among the artists whose work is on display in the Making Otherwise exhibit. She uses Mi’kmaw basket-weaving techniques learned from her great-grandmother to construct woven portrait busts, which look like masks that cover a person’s head and shoulders. The masks are artifacts that draw on tradition and anthropology, as well as an expression of emotional battles. On Nov. 15, Johnson will be constructing one of these face masks around a live model. The performance will last up to four hours and the portrait bust will be a part of the series, L’nuwelti’k (We Are Indian).